Last time round, we inspected the guitar for problems that we need to address. This edition, I’ll discuss the line we’re going to tread between repair and restoration. Then we’ll get started in earnest by pulling off all those bits we’re going to replace! Beginning a fairly big project like this we need to decide what is our goal? Are we trying to restore this instrument, as best we can, to the condition it was when it first came out the Kalamazoo factory in the 60s? 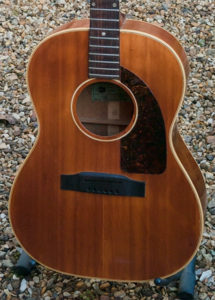 Or are we trying to repair this guitar so it can live on as a working instrument? Valuable, collectible instruments are usually restored using authentic materials, parts and methods so as to preserve the value of the instrument. This guitar, however, is destined to be a player’s guitar. So, while we will be sympathetic in our repair, we are not going to be slaves to the original design and construction of the instrument. I talked with the owner and we worked out what needs done so he can use this guitar day in, day out. ← Heck of a Mex!